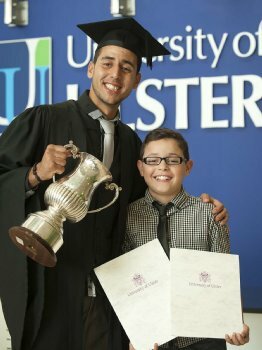 The 2013 Step-Up graduation ceremonies moved to Jordanstown campus today, as pupils from schools in the Belfast area were recognised for competing the innovation school science pathway programme. Professor Anne Moran, the University of Ulster’s Pro-Vice-Chancellor for Educational Partnerships & International Affairs, presided at the ceremony, held in the Assembly Hall at Jordanstown. Also attending were officials from the Department for Employment & Learning, as well as parents, teachers, family and friends of the Step-Up pupils. "There are some great successs stories here today, and it’s a fantastic opportunity to acknowledge the immense contribution of everyone involved, from our industrial partners, the Department for Employment & Learning, schools, the students, family, friends and classmates. Schools attending included the Christian Brothers Secondary School; Ashfield Boys’ Hgh School; St Joseph’s College, Belfast Model School for Girls; Belfast Boys’ Model School ; Orangefield High School; Corpus Christi College; Ashfield Girls; High School, and St Patrick’s College. Step-Up is a unique and innovative intervention programme that provides new learning opportunities for talented young people who live in areas of social and economic disadvantage. The programme aims to raise pupil’s aspirations, expectations and academic performance, thereby enabling them to progress to Higher Education. The programme, which has been operating successfully in Derry/Londonderry since 2000 and Greater Belfast since 2006, actively involves the University, schools, local industry, hospitals and government agencies in a collaborative partnership. The partner organisations contribute to the teaching of the Double Award GCE Applied Science qualification within a highly structured programme of academic and vocational activities.